While I’d never go as far as to say that email marketing is for everyone, it certainly is effective for most businesses – small, large, B2B, and B2C. And to those who still believe email (marketing) is dead, you are wrong. Yes, I said it: you’re flat out (dead?) wrong. Study after study continues to prove that not only is email NOT dying, it’s actually thriving. Blogs were supposed to kill email (they didn’t). Social media was predicted to be the next email killer (it’s not). In fact, it’s actually playing out in just the opposite way. Like Robin needs Ben Affleck…err…Batman, social media needs email marketing. The reality is this: Email marketing, while certainly not dying, is evolving. So if we agree that email is evolving, the real question is: Are YOU evolving your marketing program to adapt to all of the changes? As mentioned above, I’ve been part of the email marketing industry for the past 8 years. I turned 37 and a half on August 23rd (yes, I celebrate my half birthday). Doing the rough math, half of my post-college working career has been spent in email marketing! I know email marketing. I love email marketing. You could say I’m an email marketing evangelist. That being said, over the past few years I’ve started to really observe the marketing industry shift from just “doing” email marketing to actually running coordinated, cross-channel, TRULY integrated, automated marketing programs. 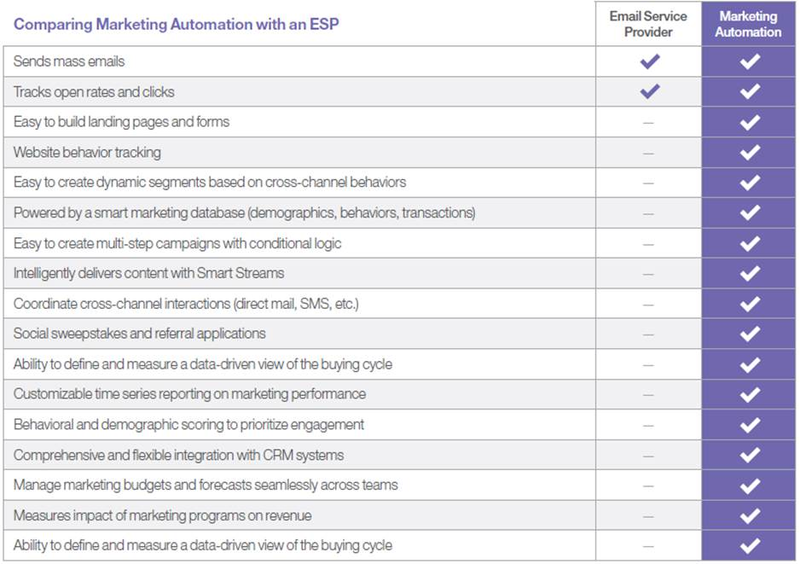 I’ve seen the power of a marketing automation platform compared to your average email service provider (ESP). And to be clear, it’s not that traditional ESPs don’t work. They can deliver results – really incredible results. I’ve seen many ESPs help clients deliver amazing ROI. However, they often don’t have the tools in place to consistently – and as easily – allow users to create relevant, conversational, multi-channel, and strategic messages. If you really want to step up your email marketing game, it’s time to graduate to a much more powerful solution – marketing automation. This is where my personal journey from ESP to marketing automation meets my professional career. You see, if I’m going to preach (evangelize!) the power of marketing automation, I figured it was about time to jump in – head first – and graduate to the world of marketing automation. On September 16th, 2013, I’ll be joining the Marketo team as its Digital Marketing Evangelist. Yes, that’s right. Email marketing is evolving and I’d like to be part of that transformation. Marketing automation is the answer and Marketo – as the leader in this space – is who I’m going all in with. Email service providers (ESPs), vendors that primarily provide batch and blast email capability, can’t deliver the behaviorally targeted engagement needed to stay relevant, let alone the integrated multi-channel conversations necessary to maximize the impact of marketing. Doesn’t behaviorally targeted engagement sounds a heckuva lot better than batch and blast? Remember when a cell phone was just that…a cellular telephone? It was able to send and receive phone calls without being tethered to a cord that was plugged into the wall. It was revolutionary. It worked. It was effective. Then the smartphone was introduced. Not only was it a device that could “send and receive phone calls without being tethered to a cord that was plugged into the wall,” it could also send SMS (text) messages, connect to the Internet, and (now) do a boatload of other tasks. Email marketing is like the early cell phones, while marketing automation is like today’s smartphone…one that’s getting smarter and more powerful. See what I mean about primitive cell phone vs. smartphone? But My Email Marketing Program is Working! I hear that statement all the time, but framed as a question: Why would I move to a marketing automation solution if my current program – using an ESP – is working? Don’t fix it if it’s not broken, right? As mentioned above, it’s not that traditional ESPs don’t work. All you need to do is search “email marketing case studies” and you’ll find a plethora of data to support the power of email marketing as told by ESPs, of course. (Let me Google that for you). That being said, let me be clear about one thing: marketing automation is not for everyone. A proper upgrade to a marketing automation solution requires an upfront commitment: time, money, and brainpower. You will be forced to think – long, hard, and strategically – about your marketing program. Not every person, not every company, is ready for that level of commitment. However, once you are ready…once you take the leap…once you invest the time, the money and the brainpower, marketing automation solutions are significantly more powerful, more effective, and easier to manage than most email marketing programs. I’m taking the leap. I’m investing the time. I’m ready to make the jump from email marketing to marketing automation. I promise it will be a fun ride. P.S. We have an entire section in The Definitive Guide to Engaging Email Marketing that’s dedicated to this topic. Download your (free!) copy now.